Here is a perfect example of what looks like a "Great Deal" on paper but in reality is not only a horrible deal but one you would want to avoid and never ever consider buying. Take a look at this vehicle. It was being sold at a dealership in Grand Rapids. It was listed on Cargurus.com as a Great Deal. It had many people that "saved" it as one of their favorites. The problem is that it really is a vehicle with some serious issues. On Cargurus.com they really don't ever show you the history report. They tell you they use AutoCheck History Reports but they don't show you any of the data. You have to pay for it. Autocheck also misses quite a bit of stuff that Carfax does not. In this example Autocheck said there were no issues. Now take a look at the Carfax and see if this is something you would buy. 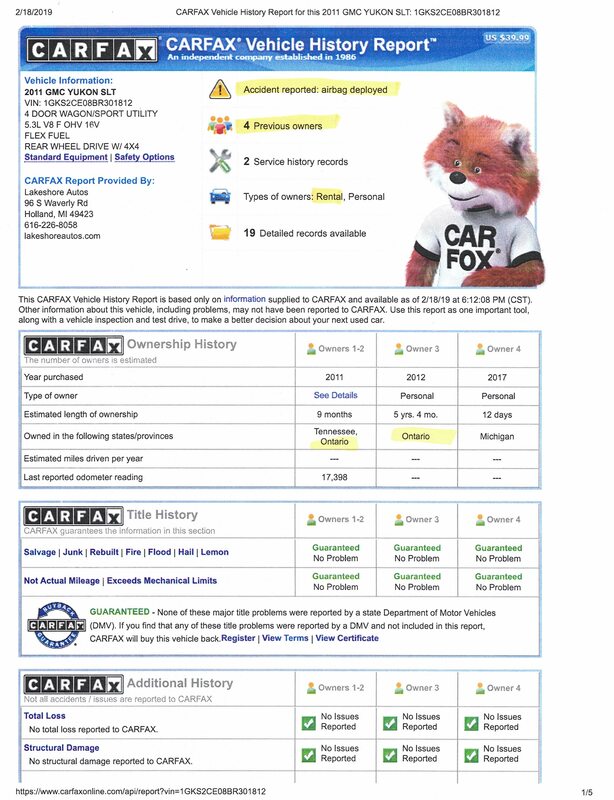 What the Carfax is showing is pretty bad. Most people want to buy a nice One Owner vehicle. This Yukon has had 4 owners. People hate buying vehicles that have been in an Accident. This vehicles has had 2 - one with Airbags deployed. Both seem pretty bad. Buying a vehicle that spent its life in Canada is not a good thing. Buying a vehicle that spent time as a Rental Car is also not a good thing. This Yukon has BOTH. Another thing that is very bad is Mileage Inconsistency or Odometer Rollback. Carfax show a potential issue with this as well. If all of this was not bad enough, the vehicle has some huge mechanical issues. It needed major repairs just to be road worthy. Many people spent their time going and looking at this vehicle because it was listed as a great price. They all walked away from it because it looked bad and drove bad. They didn't even get to see the Carfax with all of the other issues. After a couple of months the dealer lowered the price and fixed some of the obvious issues but left many others. The vehicle sat and sat with everyone looking that came to look at it running for the door. The vehicle sat on the lot for over 400 days. Just because a site like Cargurus.com tells you something is a Great Deal and priced $2,528 below market price does not mean it is so. This vehicle would have still been a horrible deal for someone even if it were priced $5,000 lower. No one should ever consider buying a vehicle like this. It checks off almost every Red Flag and could not get any worse. Sites like this are not doing consumers any favors. In fact they are making it worse. Buyers are filtering out vehicles that say Fair Deal or Good Deal and only focusing on the ones that say Great Deal. If they visit the dealer and assume the Carfax is fine or never ask to see it they could be buying a vehicle with major issues and spending thousands more than they should. 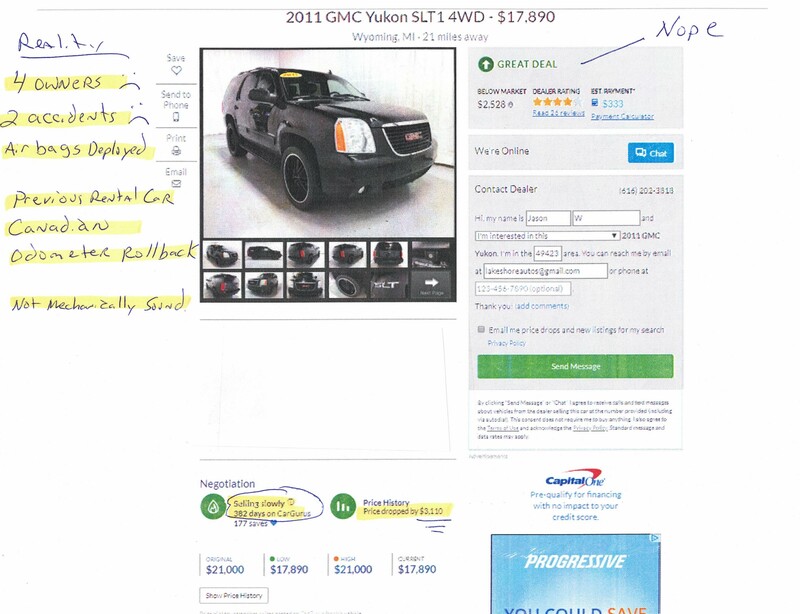 Dealers want to be shown on these site as deals but in order to show up like that they have to NOT spend extra money of vehicles. Many times they won't service or repair issues that should be done before a customer walks in the door. They also buy vehicles that may have a few blemishes, smell like smoke or are missing lots of popular options. Those vehicles are cheaper to buy and would show up as Deals compared to another vehicle that was in above average condition, serviced/repaired with no issues and ready for a new buyer. Dealers are reluctant to spend money to make the vehicle nice because all of those things raise the price and they might lose their Deal listing. Unfortunately the only way to know if you are getting a deal or not takes lots of research and legwork. You will have to see and drive many of the same types of vehicle. You will have to note condition, history report, options and many other factors that go into the real price Value.